For 2015Q1 GDP growth is now estimated at 0.4% (revised up from 0.3%). Growth was last lower than this in 2012 (Q4 when it was -0.4%), at the height of worries about the double dip, and with the Chancellor poised to reign in his austerity policies. In parallel growth in household income has been stronger as earnings growth has come off the floor, with for example four quarter growth in wages and salaries of 5.5 per cent last higher before the crisis (though the latest figures are exaggerated by the exceptionally low figures this time last year). But the sum of the parts of years of unprecedentedly low wage increases set against ongoing rises in consumption has meant that the saving ratio (that measures the difference between spending and income) has steadily shrunk. In 2015Q1 the saving ratio was 4.9 per cent, down from 5.9 per cent in 2014Q4, and the lowest figure since the crisis erupted in 2008. 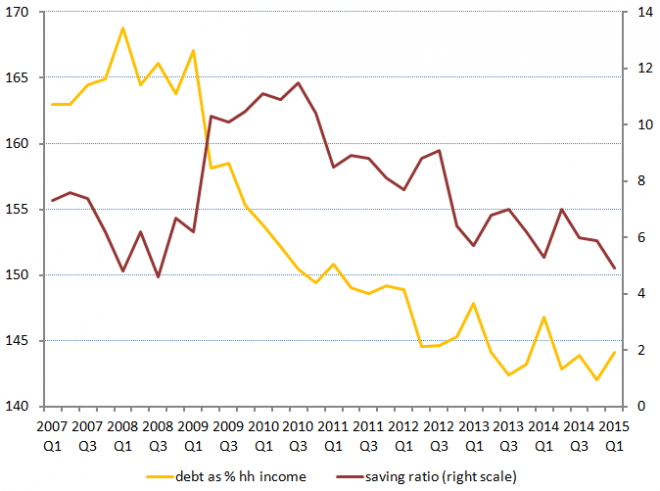 In parallel household deleveraging appears to have stalled (in gold), and debts as a share of income rising again into the latest quarter (see fuller discussion here). The suggestion is that even the diminished gains in the economy over the past year are barely affordable to households struggling after years of low earnings (and others pose similar questions of the current account/balance of trade position). This is not how it was meant to be. Exactly how would TUC aim to increase GDP? How would you increase exports? Let’s have some positive, constructive thinking!